How do I book a keys2drive lesson? A large number of our driving instructors are accredited for the keys2drive program, we welcome keys2drive bookings. You are able to see which of our instructors are accredited for the keys2drive program from within each instructor profile. To view the instructors available in your area, enter your pickup suburb and preferred transmission into the 'find an instructor' tool below. 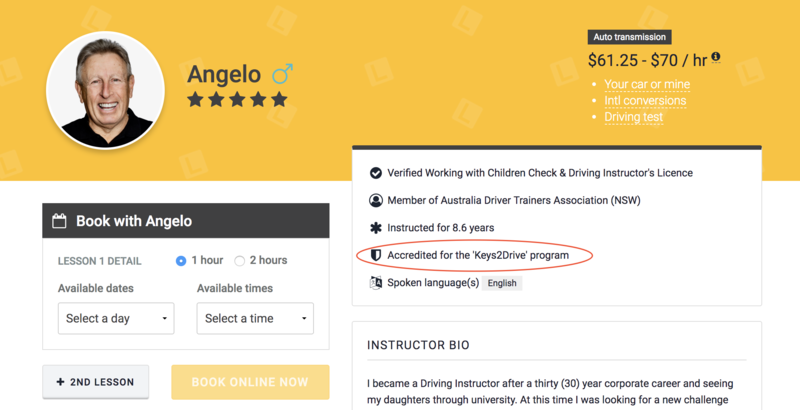 An example of an instructor profile is also below, highlighted in 'red' is the instructors keys2drive status. A keys2drive lesson is not an ordinary driving lesson, our instructors have suggested that a keys2drive lesson should only be conducted after some basic driving skills have been acquired. For this reason our online booking system will only make a keys2drive lesson available for booking after two ordinary driving lessons have been completed. This lesson is FREE of charge. You can ensure you qualify for the FREE lesson here. Use the search tool below to find an instructor and make your first lesson bookings. As soon as you have completed 2 lessons we will prompt you to book a keys2drive lesson on your very next booking.